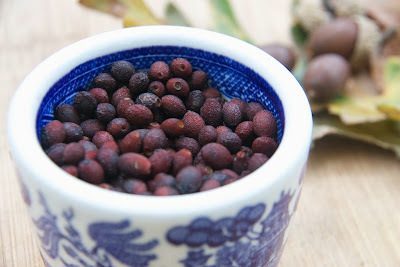 This culinary experiment was inspired by Melissa Price and her demonstration of how to extract acorn starch from unleached acorns. She and Sam Thayer use acorn starch for pie fillings and fruit bars; I thought acorn and spice bush were a natural combination. 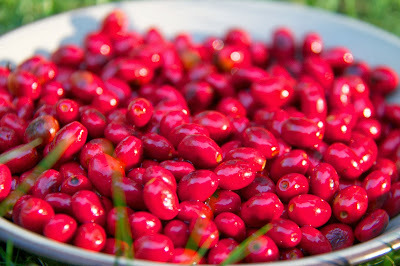 I harvested the berries on Friday. A gentle morning stroll in warm sun with easy picking. After spending the night in the dehydrator, the fruit looks distinctly less shiny and bright but all its flavors were concentrated and preserved, just waiting for someone like me to come along with her spice grinder. Dissolve 1/4 cup acorn starch in 1.5 cups cold water and whisk. Whisk the sugar/spice bush mixture into the starch and stir regularly over medium heat until the pudding starts to burp great thick bubbles. Turn down the heat and continue to stir for 4-5 minutes, then pour into a square or rectangular, glass or pyrex pan and refrigerate. The stiff, shiny, jelly is easy to cut into slices. In Korean cooking, acorn jelly is served as a savory dish, often with kimchi or soy sauce and vegetables. My dessert version comes with a dab of cream and a few chopped nuts. I like a little crunch in the midst of silkiness. Very cool. Was the acorn starch cold water leached? Wow. Sounds sooooo interesting and good. You are a maniac, Woman. 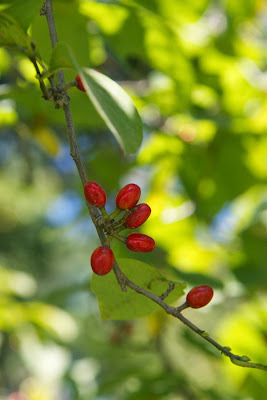 Glad to know the spicebush berries are in. 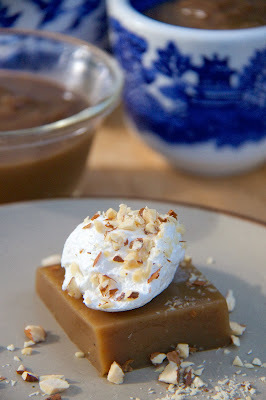 I just saw a recipe for coconut tembleque, which I'm sure you could also make with acorn starch. I will share (and will you teach me Melissa's method?)... your spicebush concoction looks divine!